To celebrate the launch of Umbrella: Winter City Sounds, Jetstar in collaboration with Music SA and Majestic Hotels, is giving away a South Aussie music festival getaway. Happening across some of Adelaide’s most iconic music venues, Scouted mini-festival will see 16 emerging artists perform over four stages at Jive, Rocket Bar, West Oak Hotel and Nexus Arts. The performances coincide with Adelaide playing host to the second annual AIR Awards, which brings music industry leaders and independent artists from across Australia into town, who have an opportunity to check out the exciting live music talent we have in SA. The Australian Independent Record Labels Association (AIR) is this year celebrating the 12th AIR Independent Music Awards at Adelaide’s Queen’s Theatre on Thursday 26th July, 2018. Adelaide, a UNESCO City of Music, will see over 40 of Australia’s finest recording artists nominated for one of this year’s coveted awards, thanks to the support from the South Australian Government. AIR has provided a launch pad for many Aussie music success stories, and Scouted is the perfect opportunity for SA musicians to strut their stuff on stage for industry professionals. All you have to do to for your chance to go in the draw to win this incredible prize is visit http://umbrellaadelaide.com.au/win/ and fill in the form. Winners will be announced at 5pm on July 1st 2018 via phone and follow up email. 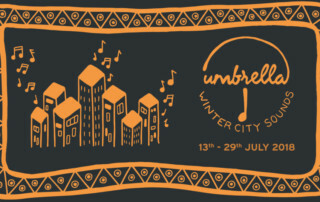 In the meantime, check out the 2018 line-up for Umbrella: Winter City Sounds and Scouted and start booking your tickets to beat the winter blues with some hot tunes.